After two years of studying, traveling and bonding together, members of the most recent class of Wexner Leadership fellows wanted to do something more. And they wanted to do it together. All 19 Wexner grads got together and pooled funds—a total of $50,000 in personal gifts to support collaborative and innovative philanthropy in the Jewish community. This inspiring move by emerging leaders leveraged an additional $100,0000 from a Grants Committee of the Jewish Community Foundation of Greater MetroWest, that Federation’s endowment and planned giving arm. In addition to the funding, experienced leaders from that grants committee teamed up with the Wexner group to engage and help guide the process. Thus was born Greater MetroWest’s first Innovations Fund. 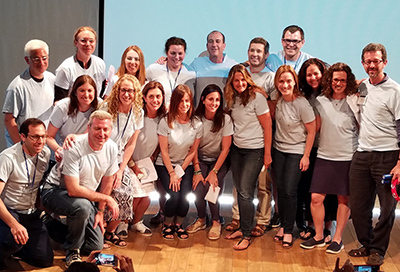 More than ever the Wexner fellows and JCF community leaders want to pioneer fresh and exciting programs that foster meaningful engagement in Jewish life in Greater MetroWest NJ. In its first year this $150,0000 fund is targeting out-of-the-box ideas that will reach single or married individuals without children (ages 21-45), interfaith couples and families, and LGBTQ community members. “We are hoping to connect with audiences that don’t currently feel engaged in our community and to encourage inclusivity. We are tremendously excited about the opportunity to foster innovative programs in our community,” committee member Bill Cohen explains. As a suburban community with no central location, Greater MetroWest NJ has unique challenges. The committee hopes to attract interest from national programs that will customize efforts for the community, reboots of local programs targeting the priority groups, as well as projects still in the conceptual stage. The Innovations Fund seeks multi-year macro grants. The JCF Innovations Fund selection committee’s top priority is to support programs that make everyone feel comfortable engaging Jewishly in the Greater MetroWest community. Apply by October 31, 2018 at https://jcfmetrowest.org/grants.